Azane oxide, a tautomer of hydroxylamine. 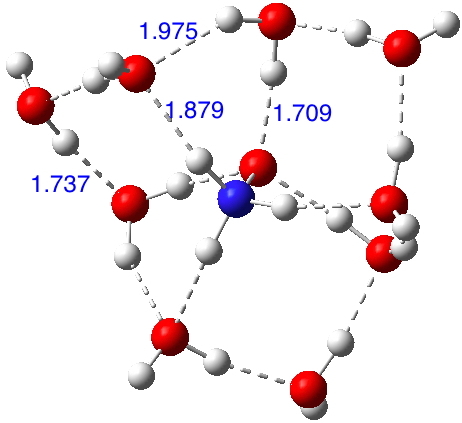 In the previous post I described how hydronium hydroxide or H3O+…HO–, an intermolecular tautomer of water, has recently been observed captured inside an organic cage and how the free-standing species in water can be captured computationally with the help of solvating water bridges. 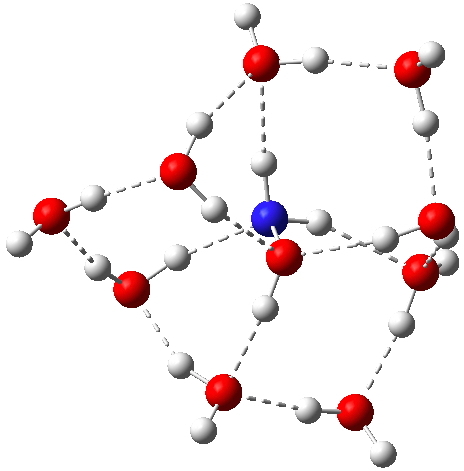 Here I explore azane oxide or H3N+-O–,‡ a tautomer of the better known hydroxylamine (H2N-OH). The usual search of the Cambridge structure database reveals only two (related) entries, the second reported in 2015..
Now, location of hydrogen atoms is always a bit tricky, but here we see two species H3N+-OH…–O-+NH3 connected by a strong hydrogen bond of 1.54Å (click on the above image to see this packing). However, it is noteworthy that the N-O bonds for each of these species are exactly the same length (1.412Å); one might have imagined that whether the oxygen carries a proton or not would affect its bond length to nitrogen. There is here a strong hint that energetically the azane oxide might be relatively low in energy relative to hydroxylamine and perhaps that the zwitterionic form might be favoured when captured with hydrogen bonds. So certainly time for a computational exploration of this species. I am using the three water bridges as before, each comprised of three water molecules and the ωB97XD/6-311++G(d,p)/SCRF=water method. In fact the structure optimises to a delightful propeller-like geometry in which bridges are formed from both two AND three waters across the ion-pair, with overall three-fold C3 symmetry (i.e. chiral! Indeed, this species has a predicted optical rotation of 40° at 589nm). Hydroxylamine itself has a less symmetric arrangement of hydrogen bonds, with a free energy in fact very similar (within 1 kcal/mol) to the ion-pair isomer. Here, a stochastic (statistical) exploration of all the various arrangements of water would be needed to be confident that the lowest energy form had been located. I would note that the N-O bond lengths in the ion-pair and neutral forms are respectively 1.399 and 1.435Å. 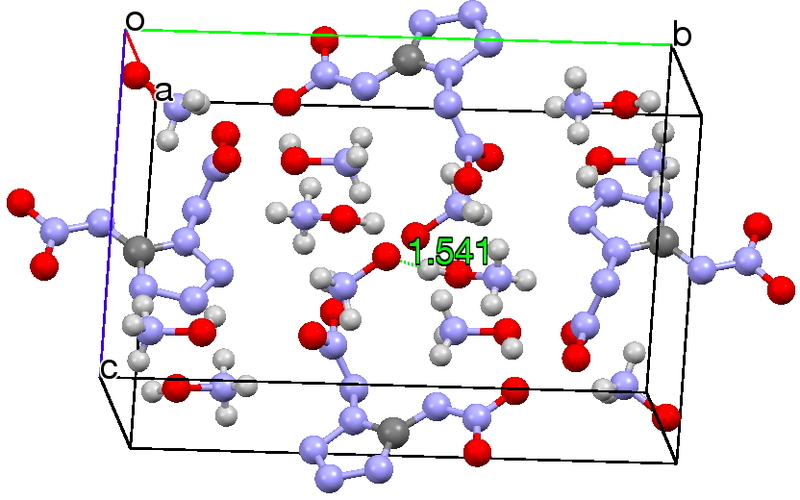 Certainly, this very brief computational look at azane oxide suggests that concentrations of this species in aqueous solutions of hydroxylamine might be appreciable (detectable). Its "trapping" inside a suitably designed cavity must be a realistic possibility (the cavity used to trap hydronium hydroxide probably does not have the correct dimensions for this purpose), as indeed illustrated in the two crystal structures noted above. ‡ I have represented this species in ionic form, but you may find text books showing it in dative form, or H3N→O. My personal inclination is to always prefer the ionic form, if only because it enables connections/analogies such as the one here to hydronium hydroxide to be more easily made. This entry was posted on Friday, April 15th, 2016 at 10:03 am and is filed under General, Interesting chemistry. You can follow any responses to this entry through the RSS 2.0 feed. You can leave a response, or trackback from your own site. Azane oxide, a tautomer of hydroxylamine. is licensed by Henry Rzepa under a Creative Commons Attribution-Noncommercial-Share Alike 3.0 United States License.